The letter from the 13 Cardinals to the Pope against the stifling of the Synod and Bergoglio’s modernist theses is quite sensational, especially because of the authority of the signatories. What then happened to discredit it and obscure its explosive content needs to be told. First of all, the letter was passed off as a indication of an atmosphere of conspiracy from the so-called “conservatives”, [real] Catholics, in other words. Marco Tosatti, a serious and independent Vaticanist, correctly noted that a private letter to the Pope, with names and surnames, is the most transparent, loyal and courageous thing that we’ve seen in the Vatican of late (considering that Bergoglio himself – in words, at least, asks for openness). It’s the exact opposite of a conspiracy. Actually, as Tosatti says, “it provided a golden opportunity for the numerous authors of conspiracy and rebellion”. Meanwhile we learn from the German newspaper Die Tagespost – with regard to things hidden, that it is Pope Francis at Santa Marta who is having his [own] “shadow Synod” reserved to the steering of the official one. What sparked off the confusion was the denial of four of the thirteen cardinal signatories. What happened? On Monday evening, one of the signatories, Cardinal Pell, through a spokesman, confirmed that the letter had been signed by him and other cardinals and added that it was private one and had not been released by them. Moreover, he explained, that in the text of the letter published by Magister there were “errors in both the content and the list of signatures” . On Monday night we learn that the American Jesuit magazine, of a progressive tendency, confirmed the letter had indeed been signed by thirteen cardinals, all of them Synod Fathers, and gave the list with four new names, the right ones, in place of the four incorrect ones, who had denied their signature in the letter. Furthermore, the Jesuit magazine confirmed the text published by Magister as the Buenos Aires La Nación also does, in an article by Elizabetta Piqué, who is Pope Francis’ biographer and personal friend and who has many trustworthy sources. Yesterday evening, Magister published a new article, citing these reliable confirmations, wherein he restates that there are thirteen signatures from cardinals (he reconstructs the correct list, but it appears that one has disappeared) and the text is the same as the first one he published, even if the letter actually delivered to the Pope may “include some small changes. Of form, not of substance”. With the media uproar that ensued, what was essential escaped attention: the rarity of such a document signed by authoritative cardinals representing many Synod Fathers, in which they demolish the Instrumentum laboris (on the points not approved at the 2014 Synod but that Bergoglio had made sure were inserted – the most controversial ones). Furthermore, in the Cardinals’ Letter, they criticize the new procedures which stifle (and attempt to steer) the Synod in course. The letter expresses concern over the Commission that has to draw up the final “Relatio” as it had not been elected by the Fathers, but nominated entirely by Bergoglio (all of them people agreeable to him). Moreover, the Letter expresses concern about a Synod that had been convoked by Benedict XVI in defense of the family and then ended up by quarreling over Communion to the divorced and remarried: something – if it were accepted – that would make the entire doctrine on marriage and the sacraments collapse. At the end of the letter there is also a dramatic warning and even if it is written in respectful language, it sounds an alarm, by saying, that, at the end of the road embarked on by Bergoglio, in imitation of the European Protestant churches, there [would be] “a collapse”in other words – the end of the Church. In a declaration the other day, Cardinal Pell, gave other two pieces of important news about what is going on. The first matches exactly what we wrote last Sunday in this paper, which is that the Kasper-Bergoglio line is in the minority. In fact Pell says: “There is large agreement on most of the points, but obviously there is some disagreement as there is a minority of elements that wants to change the teaching of the Church on the due dispositions necessary for the reception of Communion. Naturally there is no possibility of any change in the doctrine”. The other news from Pell, even if in soft language, is this: “There are still concerns among the Synod Fathers about the composition of the committee [in charge] of drafting the final Relatio and about the process through which it will be presented to the Synod Fathers and also voted on.” The controversy now is all about this. The reason is simple, even if it is never said. The intent, now very clear, is of Bergoglio to push the Synod towards the conclusions that he wants, to receive some legitimization and introduce Kasper’s ideas inside the Church, even if in a disguised form – they way he introduced divorce through the Motu Proprio. For this reason some days ago, Bergoglio, in discovering that the majority in the Synod is Catholic – incredibly raised questions about the “final Relatio” which was even written as well on all of the official programs as the results of the Synod. Seeing the bewilderment that the change in the rules at the Synod had caused, the other day, through Father Lombardi, he made it known that there would be the “Relatio finalis”, but Bergoglio would decide what to do with it and whether it would be published. Later it was learned that probably it would not be a “Relatio” similar to that of the other Synods, wherein even single prepositions were voted on, but a vague text to vote en bloc – take it or leave it; [this] a way to corner the Catholic part, by making a generic reference to “mercy” which then could be interpreted as the “green light” for the “revolution”. In reality it would be necessary to remember – that no Pope has the power to turn the Law of God and Catholic doctrine upside down – unless he wants to fall into heresy and thus fall into decline. This is the right interpretation of “the power to bind and loose” which Christ gave to Peter – an Evangelical verse which has been improperly evoked these days by the Bergoglio Party, almost as if it would permit the Argentinian Pope to do what he pleases. The Venerable Pio Brunone Lanteri, who was also a great defender of the papacy, explained it clearly in his book: “I will be told that the Holy Father can do anything, “quodcumque solveris, quodcumque ligaveris etc.”. It’s true, but he can do nothing against the Divine Constitution of the Church; he is the Vicar of God, but he is not God, nor can he destroy the work of God”. Comment : 13 Heroic Cardinals, what they have done will be written in the History of Church, for the record they are accused of conspiracy by the conspirators themselves, below a video from Cardinal Burke, quite clear as well, the Triumph of our Lady is close, stay strong. Many Catholics are waiting for a clear position of the Pope before they defend the Truth on Marriage. Why? Recent popes have already stated clearly and conclusively on that. Indeed, everybody understood their words, both the ones who liked and those who didn’t like it. That’s how God speaks, clearly, saintly, without any blur on the words. If there is still any doubt, we better read it again.The Catholic doctrine is quite easy to understand, though is difficult to follow. His Holiness, Pope Francis, in the right moment will defend the same Truth of ever, no matter how hard it can be for us, because God is not fashionable. It is vain to hope for a new Truth, or a new hermeneutic for the words of Jesus. That possibility – if there is any – is truly nightmarish, and we must pray to avoid it while that it is still possible. May God protect our Father Holy from any kind of temptation of pride or other and he never ceases to be in fact the Vicar of Christ. So, if there is still any doubt about the Catholic Marriage or about any other sacrament, because of the ambiguity in some of the attitudes or sentences of His Holiness Pope Francis, or maybe because of the uncountable misunderstandings in the media, we better get some support from the writings of his predecessors. 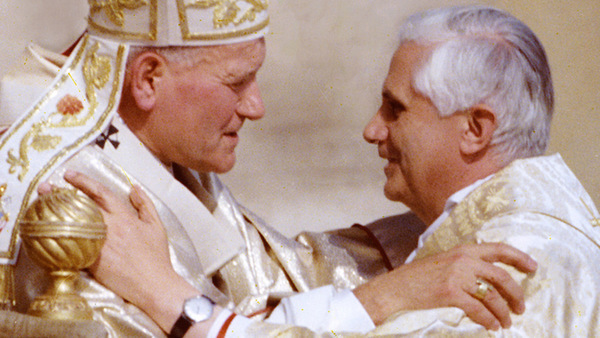 By the way, one of them is still alive and shall be one day recognized as a doctor of the Church because of his wisdom, holiness and true humility. I have no doubts about that. Hi Basto my Brother, we will know more about Pope Francis after this Synod, confirmatin of the Teaching of the Church or not then this blog will make an official annoucement, let’s Pray.